From 107 applicants to the lucky final seven, the second installment of Cleveland Chain Reaction has reached its exciting conclusion. 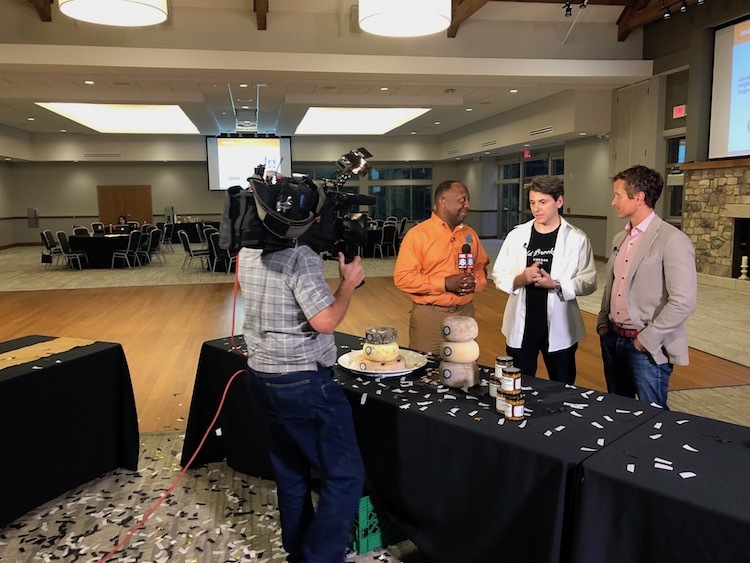 This morning at Cleveland Metroparks Zoo, Fox 8’s Kenny Crumpton announced the seven winning businesses chosen to receive over $700,000 in investment (more than $200,000 over the initial commitment). The announcement also foreshadows the next wave of economic development in Old Brooklyn, this year’s Chain Reaction neighborhood. Kenny Crumpton talks with Michael Januska of Old Brooklyn Cheese Co.The selected businesses range from those who already operate in Old Brooklyn and seek to expand (Vino Veritas Winery and Old Brooklyn Cheese Co.) to new entries for the neighborhood, including Cleveland House Hotels, Her Blue Wear, Immaculate Cleaning, Randy’s Pickles, and Sidekicks Salsa. What the businesses all have in common is an established customer base and a desire to take their business to the next level with outside investment. 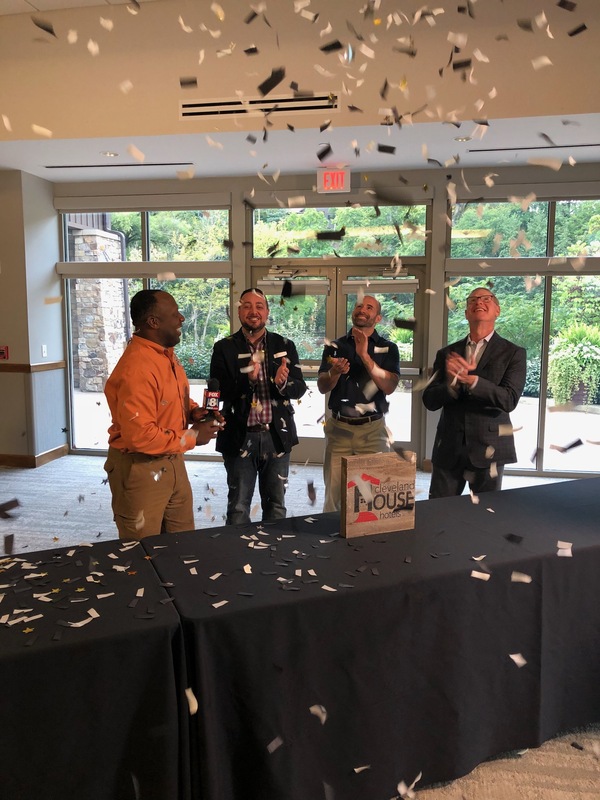 Today’s celebration at the Zoo marks the culmination of a four-month process that began with the application deadline in June, followed by the selection of 18 semi-finalists in July and their pitches at the COSE Business Showcase, and the finalist announcement in late August. The project was the result of a collaborative partnership between the Council of Smaller Enterprises (COSE), GlazenUrban, Cleveland Neighborhood Progress, and JumpStart—which Glazen says was the secret sauce behind its success. "These partners are the foremost organizations in Cleveland's neighborhood scene. How often do you see four disparate organizations working together as partners to make something happen?" says Glazen. "Things like this never work, but we were able to team up and do some good together." Cleveland House HotelsIndeed—Glazen says that the Old Brooklyn Chain Reaction initiative far exceeded all expectations, with seven businesses chosen (instead of the original projected five) and $700,000 in investment (instead of the original committed $500,000). "I had tears in my eyes when we added it all up and the letters of intent came in," adds Glazen. "We had a lot of lessons from [the first installment] that resulted in an extraordinary group of people: investors, applicants, and partners." The five private investors driving the momentum are car dealer Bernie Moreno, Exacta Companies president Rick Blaszak, Paro Services Co. CEO Dan Zelman, fast food entrepreneur Vanessa Whiting, and Windfall Group president Eddie Ni, and Glazen says they're already eyeing more "top-flight investors" for the next round. Looking forward, Glazen says they will “definitely” do Cleveland Chain Reaction again in 2019, potentially announcing the next chosen neighborhood as early as end of this year. A prime-time special will also air on Fox 8 later this year documenting the Old Brooklyn installment. Congratulations to all of this year's Chain Reaction businesses!